On several occasions I have mentioned how proud I am that I have not missed a single update for Crimson Dark since it began in June last year, so please understand that I haven't made this decision lightly. The issue at stake is that writers for TV and Film in America are not receiving a fair share of residual income (ie: royalties) from distribution of their work in new, digital formats (especially the internet). Most of these writers are earning far less than the studio executives they work for, even though their work is the foundation of the studios' profits. Thus writers have come out on strike, including the irrepressible Joss Whedon and the magnificent Jane Espenson - two people who have been huge influences in my own writing. 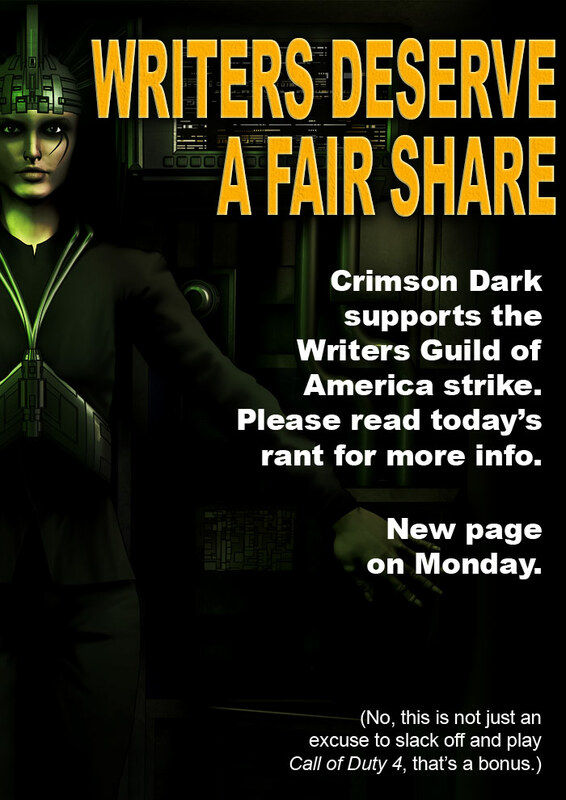 To learn more, visit the Writers Guild of America, or watch the announcement of the strike on YouTube. As an Australian who has neither written for TV nor Film, I am not directly affected by the strike. But I think it is time for an economic model which places as much value on creative output as it does on business savvy, so I fully support the writers in their strike and hope that a favourable solution can be negotiated. The comic will resume regular updates on Monday, I apologise for this brief interruption.